Picture of restored royal chapel at Bobovac, consisting of chapel, mausoleum and burial chamber. Bobovac is a fortified city of medieval Bosnia and Herzegovina. It is located near today's Vareš and the village of Borovica. The city was built during the reign of Stephen II, Ban of Bosnia, and was first mentioned in a document dating from 1349. It shared the role of seat of the rulers of Bosnia with Kraljeva Sutjeska, however Bobovac was much better fortified than the other. Bosnian King Stephen Tomašević moved the royal seat to Jajce during his war with the Ottoman Empire. The Ottomans invaded the city in 1463. Its fall hastened the Ottoman conquest of Bosnia. Bobovac is now a protected cultural site. HKD Napredak releases a monthly magazine called Bobovac. The crown jewels of Bosnia were held in Bobovac. The royal chapel consisted the burial chamber for several Bosnian kings and queens. Nine skeletons have been found in the five tombs located in the mausoleum. The identified skeletons belong to kings Dabiša, Ostoja, Ostojić, Tvrtko II and Thomas. It is assumed that one of the remaining skeletons belongs to the last king, Tomašević, decapitated in Jajce on the order of Mehmed the Conqueror. Only one of the skeletons, found next to that of King Tvrtko II, is female and assumed to belong to Tvrtko II's wife, Queen Dorothy. ^ a b "Mediaeval Royal Castle of Bobovac". old.kons.gov.ba (in English and Bosnian). Commission to Preserve National Monuments of Bosnia and Herzegovina. Retrieved 20 February 2019. 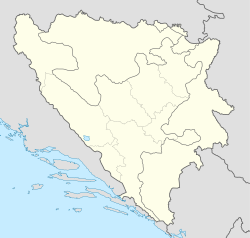 Wikimedia Commons has media related to Bobovac. This article about a castle in Bosnia and Herzegovina is a stub. You can help Wikipedia by expanding it. This page was last edited on 6 April 2019, at 20:03 (UTC).